Self-reliance and connection to the land are common threads in the history of this place—from pre-settlement societies to European farmers to the early industrial era that harnessed the bounty of the land. But modern living is erasing so much land-based knowledge and skills, as well as our identity as growers, savers, and rugged survivors. We are now citizens of the retail-financial-corporate complex, more oriented to stadiums than seedbeds. Push too hard on our modern assumptions and they crumble like an interstate bridge. American cities are one major security breach or climate event away from disaster. Artists, as usual, can show the way. For decades Minneapolis makers, growers, architects, technologists, and other creative toilers have been preserving knowledge and skills—and forging new ones—outside the mainstream cultural conversation. From urban farming and sustainable architecture to alternative transportation and homemade textiles, our artists know how to make it for themselves. This summer in the center of the city, we want to amplify their voices and widely share their knowledge. We call it Self-Made Mpls: an iconic complex, part garden, part workshop, part classroom, part prototype, where citizens and visitors can rediscover together what we’re capable of. Our team of two architects, two writers, and a community artist will create an iconic destination for experts to share self-reliant skills and for the public to understand and practice them. Garden: A series of raised boxes will grow an assortment of foods ideal for the local climate, with the produce used in workshops and in a final public meal. Some beds will grow plants chosen to clean urban air and soil, while others will host a pollinator-friendly garden to help regenerate the ecosystem. 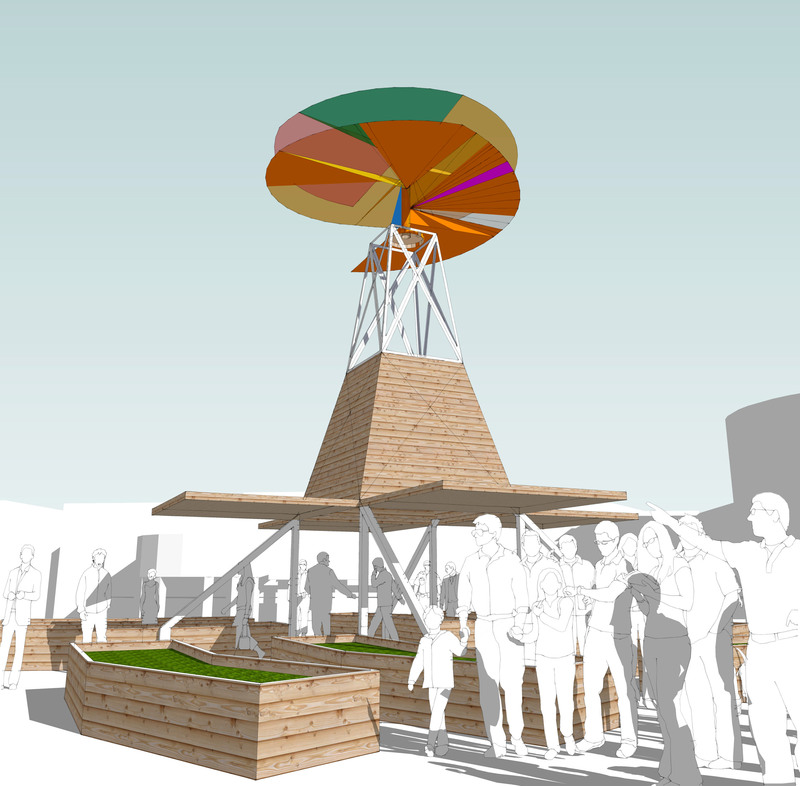 Tower windmill: A powerful beacon that draws people to the project stands as a primary axis and symbol for our endeavor. 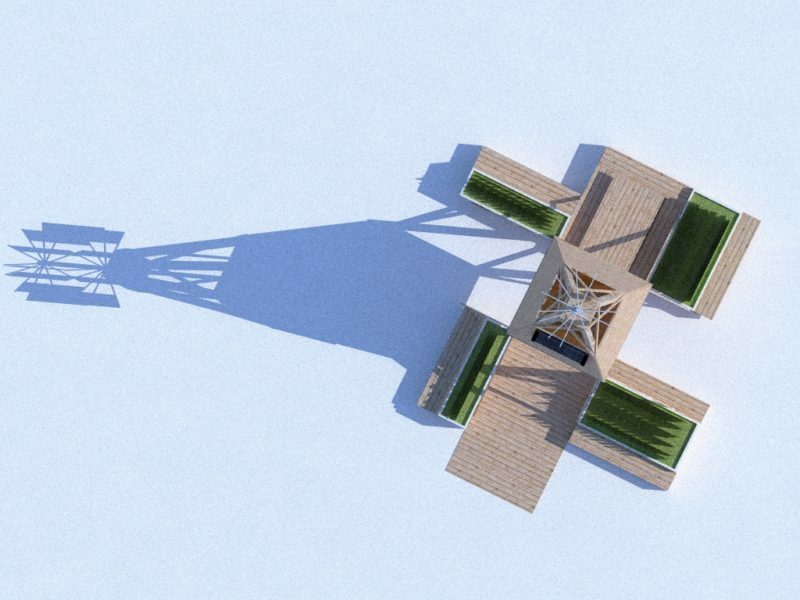 Lights powered by a mix of wind and solar energy will illuminate the tower and the structure below, while an iconic weather vane inspired by Leonardo’s helicopter—a symbol of human ingenuity—will top the tower. 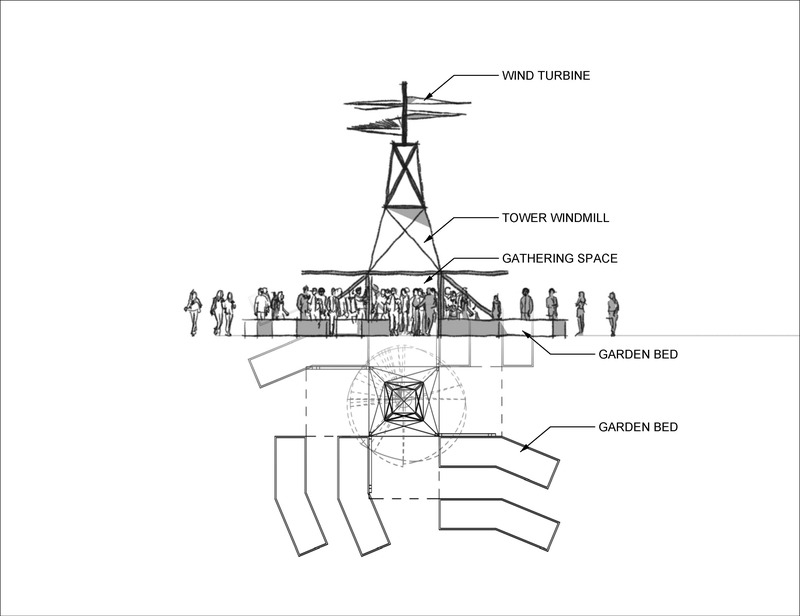 Meeting space: The base of the tower will serve as a welcoming convening space for community events, a key aspect of the project. Wall panels, closed at night to store garden tools and event materials, will open to create a canopied environment for meetings and scheduled events. Inside the structure will be tables, seating, and a resource library, including key books for education and inspiration. The project’s concluding event will be a public feast made with food grown on site in the gardens. Farmers Market: Several times over the course of the project we’ll partner with Frogtown Farm or local Hmong farmers to host a pop-up produce market on the grounds. This could be done in conjunction with a workshop such as pickling when cucumbers are in season. Publication: To ensure that the knowledge shared in Self-Made Mpls is useful long-term, we will produce a zine or newsletter that chronicles learning and resources. Copies of the publication will available free to participants and visitors late in the project. We intend to pay for the creation of this publication through a separate grant. How do we address the theme of CCC 2016? We believe Self-Made Mpls represents the best of our city and region, embodied by people passionate about their ideas and eager to collaborate. This is the Minneapolis people outside the artist and maker community rarely sees: bubbling over with ingenuity and socially- and environmentally-conscious activity. The site also makes a striking visual statement. 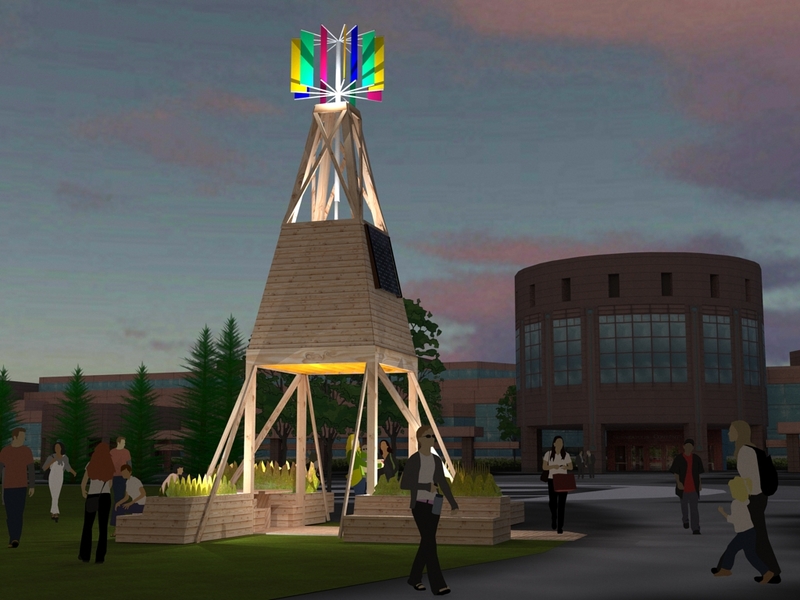 The incongruous presence of a large garden and windmill downtown will draw in visitors and locals. How do we meet the city’s goals? Adds character to the city by creating a destination that literally enhances the health and enriches the lives of Minneapolis residents. Every visitor takes away awareness, connections, and skills they can apply to living self-sufficiently. Helps recognize Minneapolis as a regional center for excellence in architecture, urban design and the arts. Our architect-designed intervention will be an engaging destination that puts a variety of local ingenuity on magnificent display. 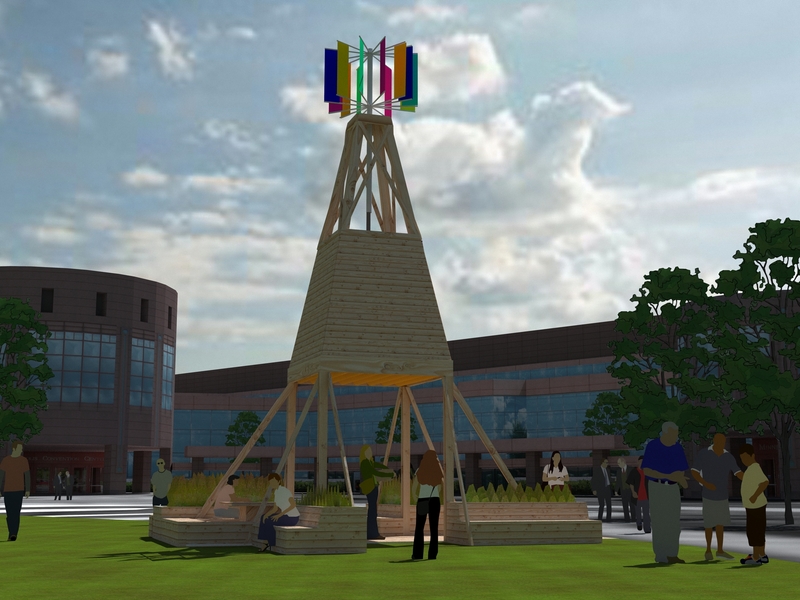 Enhances community identity and sense of place in the MCC plaza and contributes to community vitality through programming that brings people together to grow, learn, share, and survive.